IFRT is excited to announce our program from the upcoming ALA Annual Conference, “New Technologies: The Impact on Government Transparency.” Are you Interested in government transparency, its effect on libraries, and how changes in technology affect how we share information? 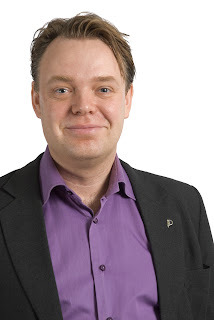 Rick Falkvinge, founder of Sweden's Pirate Party, will be joining us in New Orleans, LA, to speak about how the evolution of information-sharing tools have impacted government transparency. Who is Rick Falkvinge? He is the founder of the first Pirate Party and a campaigner for next-generation civil liberties and sensible information policy. In particular, he stresses how the copyright industries work in collusion with Big Brother hawks to erode or eliminate the parts of Internet that guarantee our civil liberties. On this platform, one of privacy and digital rights, his party became the largest in the below-30 demographic in the 2009 European Elections. When not doing politics or exploring technical subjects in detail, Mr. Falkvinge can usually be seen cooking, sampling a scotch whisky, or riding a fast motorcycle. If you care about copyright, civil liberties, and freedom of speech, be sure to include this thought-provoking program on your conference calendar. For more information on the Pirate Party (http://www.pp-international.net/) and Mr. Falkvinge (http://falkvinge.net/).